Over the past few years, the number of Internet users expand drastically. 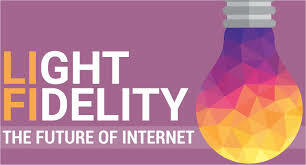 The cheaper Internet technology is the key factor behind this but still Internet users are tired of slower internet connections. A great new for all those internet users who are suffering from slow connection. Researchers at the Eindhoven University of Technology in the Netherlands developed new infrared based Wi-Fi system which is 100 times faster then current wi-fi system, around 42.8Gbit per second. The new developed system is known as "Li-Fi" which depends on central light antennas to beam rays of different wavelengths to wireless device. The researchers confirmed that this system makes your network more secure and it will not be hanged by other networking devices. The system depends only on light rays transferred by an optical fiber with no movable parts. Researchers says that it is a maintenance free system with no power consumption. This newer system is cheap and easy to set up. The light antennas have a pair of gratings which emits the light rays of different wavelengths at different angles. According to researchers this technique is harmless as it uses safe infrared wavelengths which will not affect your eyesight. Researchers said that this Li-Fi will hit the stores in just five years. The system has so far only downloaded the data using light rays while uploads are done using radio signals.